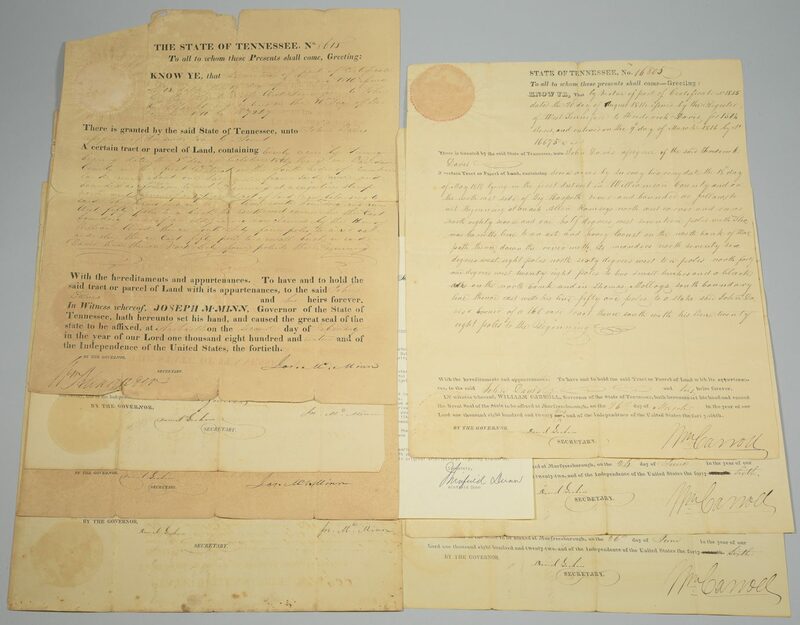 Group of eight (8) early 19th century land grants, all Tennessee Governor signed. Includes five (5) signed Joseph McMinn (1816, 1819, 1820), three (3) signed William Carroll (1822). Land awarded to John Davis, John C, McLemore and George W. Campbell. Lot also includes a 1974 letter from Governor Winfield Dunn to Sarah Hunter Hicks Green. The letter asks for her assistance in a TN State Capitol renovation project, specifically requesting access to the Giers family photographic images that may show the original Capitol lighting fixtures. Grants – 15 3/4" H x 12 3/4" W. Letter – 10 3/8" H x 7 1/4" W. Provenance: the estate of Sarah Hunter Hicks Green, formerly of Historic Devon Farm, Nashville, Tennessee. CONDITION: All with fold lines, 5 with slight toning. 2 Joseph McMinn grants with dark toning and separation/losses at fold lines, one separated horizontally at the center. Letter overall very good condition.